“Lauren and Fluffy – Swimming Team” was one of the one of the most popular series of photographs uploaded to 500px in recent memory. 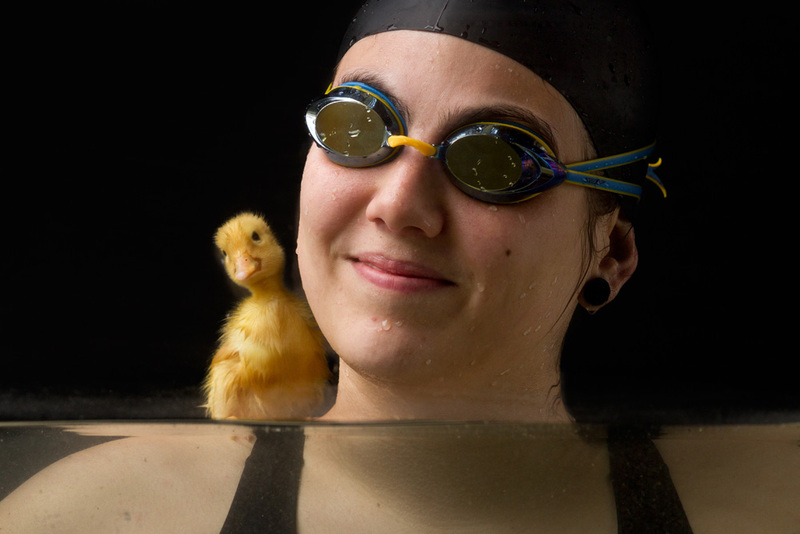 A set of adorable portraits, they showed Lauren, a swimmer, an Fluffy, a duckling, enjoying a swim together and having a blast. We featured the series when it was first uploaded, but we wanted to know more about these wonderful shots. So, we decided to reach out to photographer Juan Osorio and see if he would oblige—lucky for us, he said yes! Scroll down to find out both the story and the setup behind this wonderful little portrait shoot, including a breakdown of the challenges they faced and photos of the lighting setup so you can capture a shoot like this yourself. She is absolutely fantastic. Extremely patient and willing to go the extra mile on difficult shoots. 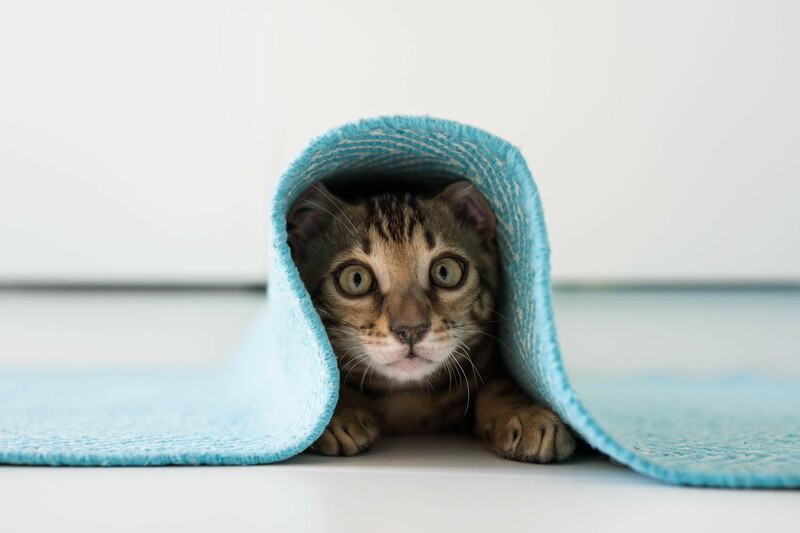 In addition, she is amazing when the work requires animal interaction, because since childhood she has been surrounded by many and diverse pets. She knows her way around snakes, tarantulas, scorpions, lizards—whatever exotic animal you can imagine. She currently works at a pet store owned by her family. My wife was not very enthusiastic about having 6 ducklings around the kitchen, so they were returned to the pet store. Fluffy, the main character, appeared some days later with a second set of ducklings. 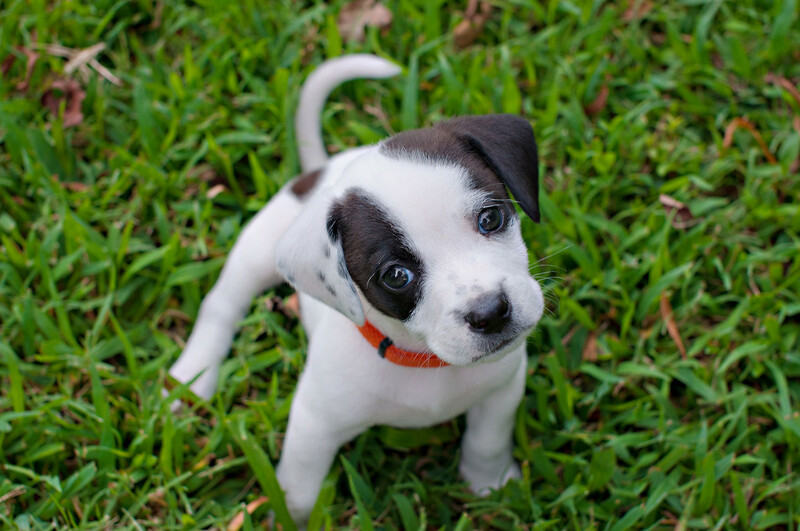 He was the smallest, but also the cutest. Lauren and I thought he would be perfect for a series of portraits. When taking pictures of any subject, I strive to learn more about it. It helps me to better capture the true essence of the person or animal… the same could be said about objects or landscapes. In this case, I was reminded of a fact about ducks that I had forgotten: namely the filial imprinting phenomenon by which a young animal acquires characteristics from its parents and also becomes attached and follows them around when they are presented within a “critical period” after being born. I saw several videos on the internet in which ducklings followed their owners while walking, and the amazing BBC short documentary about Christian Moullec and his relationship with ducklings in which the birds swam and flew with him. 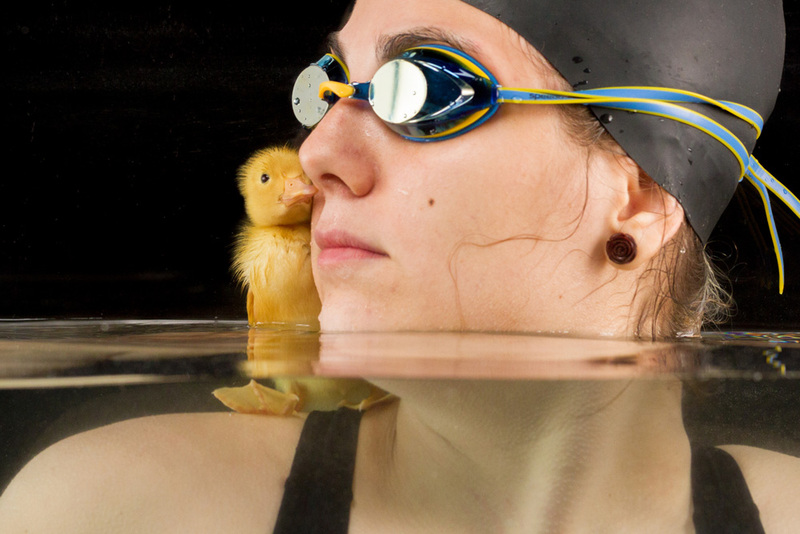 It made me wonder what would happen if a competitive swimmer had a duckling for a pet. 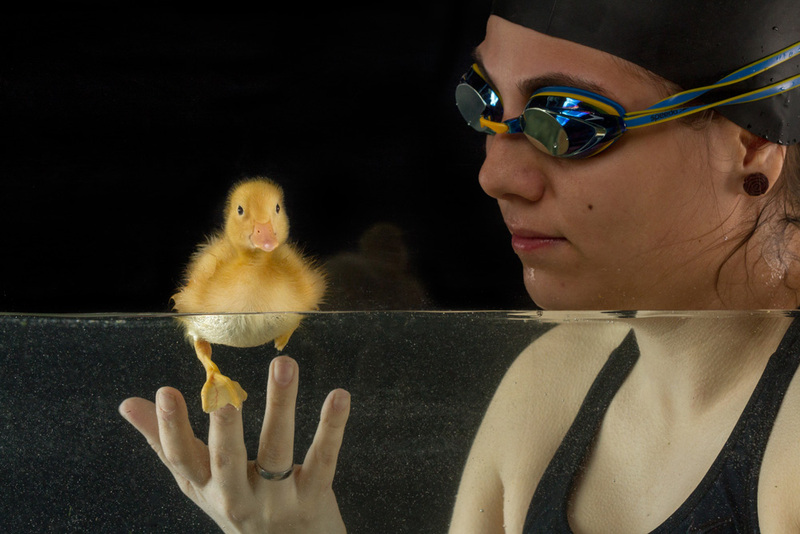 I was very fortunate that my friend Lauren was a competitive swimmer in her teen years, so we decided to try to capture her and the duckling swimming together. I frequently contribute pictures to photographic assignments for the National Geographic Your Shot community. Several weeks ago, they challenged photographers to create an artistic image, one that went beyond capturing a subject through the lens, and I decided I wanted to create a series of photographs to illustrate the imprinting phenomenon—but from the human’s perspective. I called it “friendship,” because it felt too cold to me to use the psychological term “imprinting.” Besides, I am not sure it can be applied to humans. There were several issues that made taking these images especially challenging. The first was finding a location for the shoot: we needed warm water for the swimmers, but it was the end of March and the water temperature in a river, lake, or ocean in the New York City area would be too cold for either of them; also if we had waited for the summer, the underwater lightning, scuba diving gear, and camera equipment required for properly exposing the image would have been prohibitively expensive. 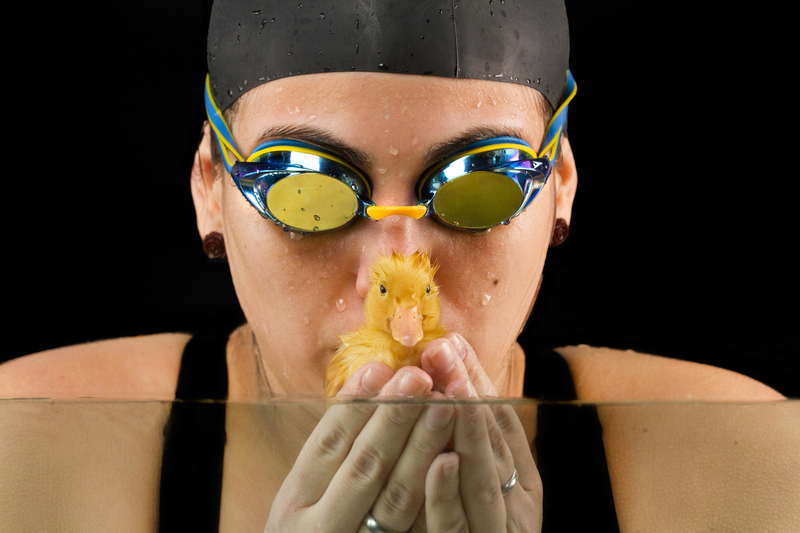 The option of using a swimming pool was ruled out as well because the chlorine would be dangerous for a baby duckling. The only viable solution was to use a plexiglass tank indoors. Fortunately, Lauren’s step father, Joe Aversa, had many years of expertise building this kind of tank for fish. The tank has a capacity of 500 gallons of water. 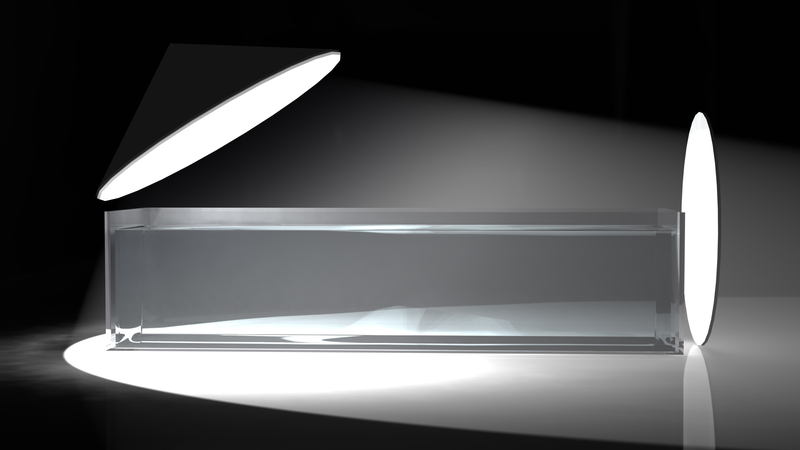 A 3D rendering of the tank and lighting setup, front view. Despite being the best option, the tank was not without its own issues. Acrylic surfaces are less reflective than glass, but still will produce a very bright spot if the light is not positioned at angles close to 45 degrees. This limited the lightning options and the possible camera angles. The space restriction can be an advantage because the models move fundamentally left and right, so depth of field and out of focus issues are less likely. 1. 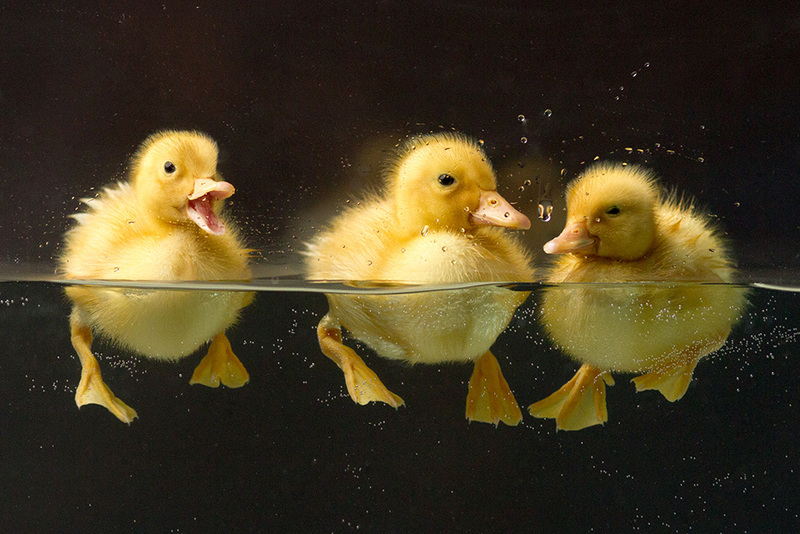 Ducklings have the tendency to make the water dirty as soon as they start swimming. 2. Also, their skin is very oily and that oil gets into the water and smears the glass after a few minutes. 3. 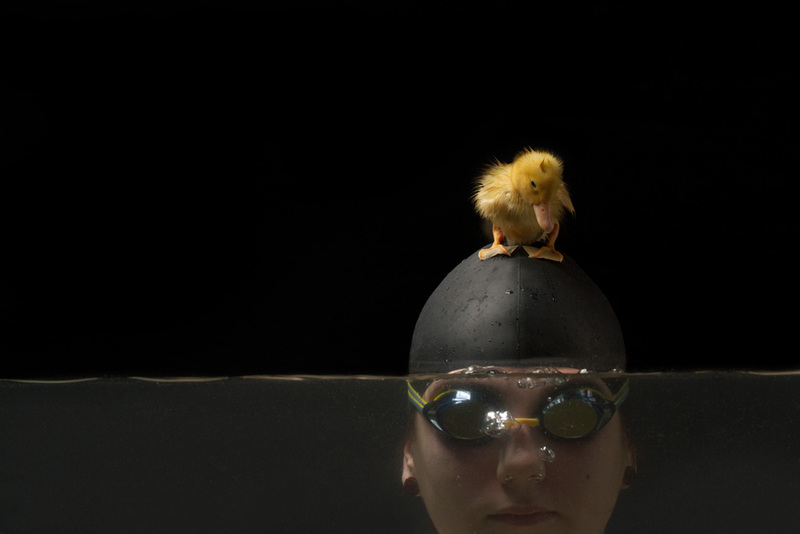 The constant movement of the model and the duckling produced drops of water above the water surface and air bubbles underneath; it also affected the duckling and model’s lightning because their relative position with respect to the light was different on every shot. 4. Filling the tank took several hours, and the water temperature had to be carefully monitored and controlled. It had to be filled one day before the photo shoot and warmed up overnight, but to minimize heat loss, it had to be covered on the top. The area of the warehouse in which we shot this pictures didn’t have a heater, so there was a significant temperature difference between the inside and outside of the tank, and this produced fog and accumulation of water drops on the walls. So in order to keep the water and tank as clear as possible, the temperature had to be kept very constant using special heaters. 5. The duckling was too excited and fast at the beginning of each session, so it needed several minutes to slow down. All these technical difficulties required that we payed very close attention to the condensation and splashing and basically translated into having to wipe the walls after every one or two pictures. 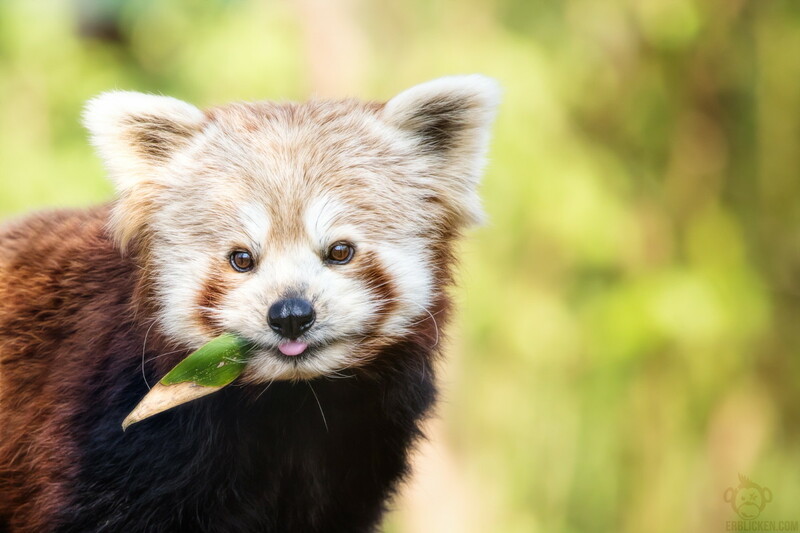 The pictures were taken with a 7′ parabolic umbrella and a reflector. On the images taken at a faster shutter speed, a strip box was used instead of the reflector. The umbrella was positioned on the left side above the swimmers between 30 and 45 degree angles and slightly moved towards the camera. 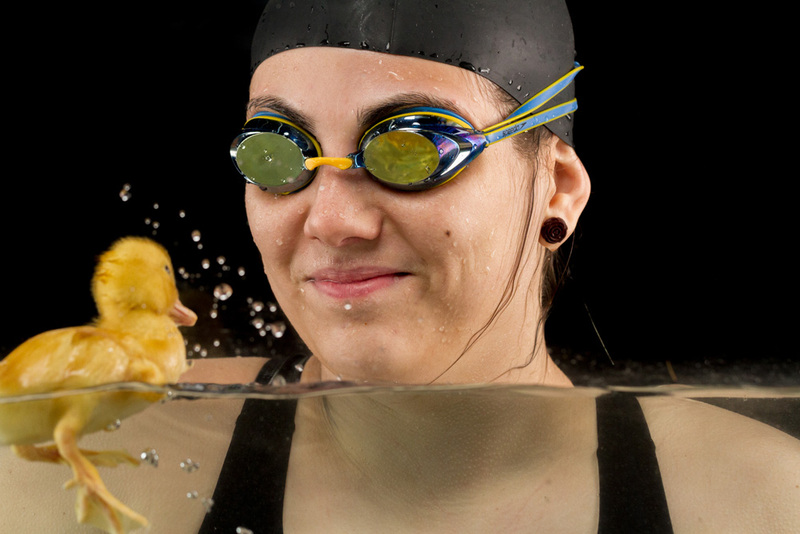 The reflector was a few inches away from the tank on the right side to fill in the back of the swimmer’s cap. 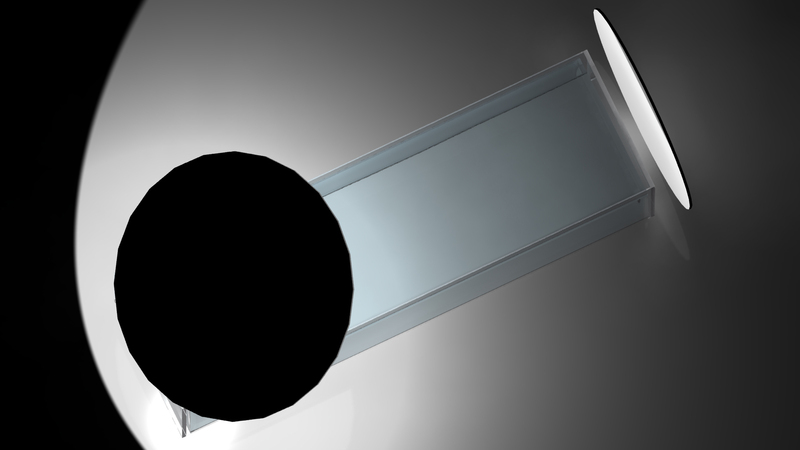 A 3D rendering of the tank and lighting setup, top view. Since we have received so much positive input about this kind of underwater photography in studio, we have decided to start live lessons allowing amateurs to learn how to photograph larger subjects that will not fit into a household fish tank. 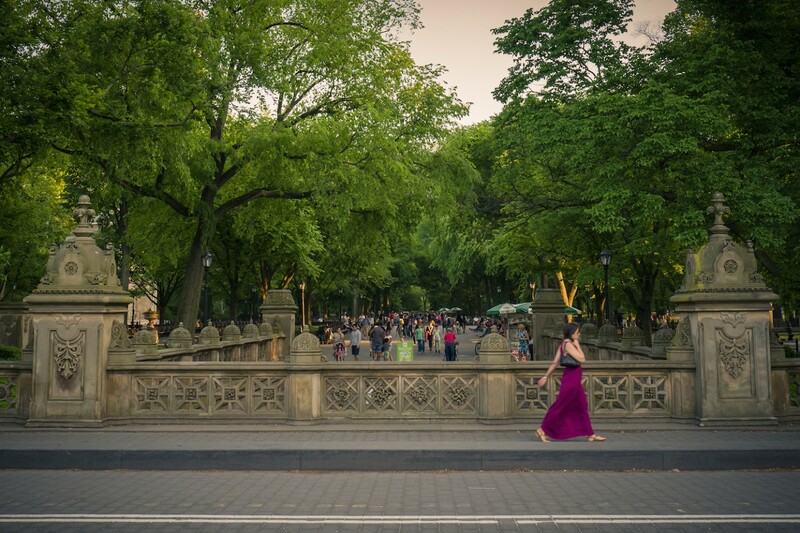 A big thank you to Juan for sharing the secrets and story behind these popular photographs. To see all of the images in the series, head over to his 500px account where you’ll find a whole lot more adorable duckling shots. You can also find his work on NatGeo Your Shot and Instagram.